Located in the heart of Southern Wales and only 20 minutes drive from Wales' capital city - Cardiff. The stunning Brecon Beacons National Park is on the doorstep, along with many great attractions, walking and cycling routes. As Caerphilly Castle is just off the A470, which you have to drive along anyway to get to and from Craig y Nos Castle from England. 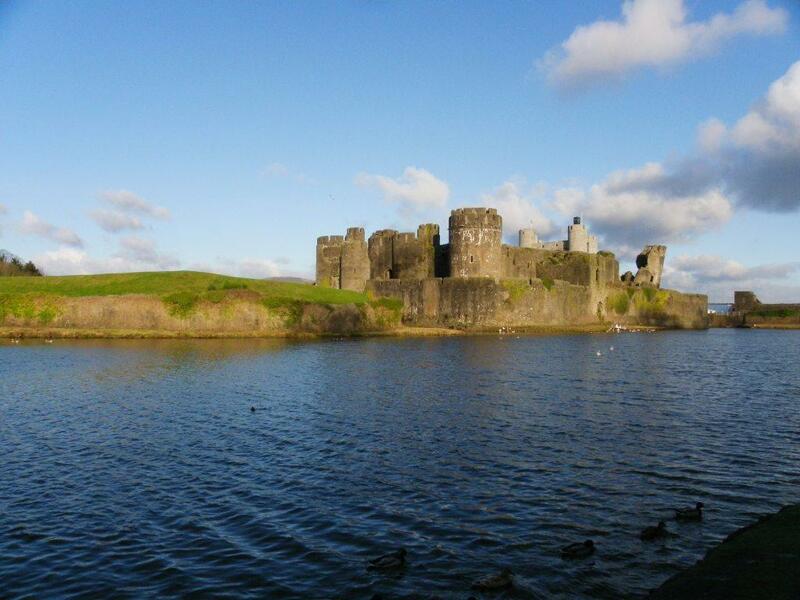 Caerphilly Castle is a good day out either for your return journey or the outward bound journey. You do need to allow a good half-day for it though. There is not so much to see within Caerphilly itself; the main attraction is the castle and the walk around it. If you have dogs you can give them a good run just walking around the perimiter of this very large castle and lake. You can see from our own photos that we arrived early afternoon, spent some time with our dogs inside the castle, and stayed walking around the moated walls till after dark. 80% of the land is countryside, making the county borough of Caerphilly a playground for outdoor activities. Visitors can discover walking trails and paths that meander along the contours of the Welsh hills, offering breathtaking scenery. For the more adventurous there's abseiling, quad biking, horse riding, canoeing, orienteering, survival skills, archery and clay shooting. The County Borough of Caerphilly has a strong and proud heritage, just like the magnificent Caerphilly Castle, Wales' largest castle with its very own Leaning Tower of Pisa. Encircled by mountains Caerphilly is an area of outstanding natural beauty - a paradise for lovers of nature and the great outdoors.